Jazz's troubled bassist gets another posthumous collection. No new insights gained here, just a reminder of his ambitions. Material from Jaco Pastorius's solo career has been compiled many times over. That's what happens to a musician who meets an untimely death. People want more, but there's only a finite number of recorded goods. 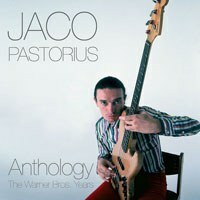 Pastorius recorded plenty of stuff during and after his tenure in the jazz fusion supergroup Weather Report. His legendary status came from him finding a highly specialized niche within the genre, that of a wizard of the fretless bass. The hit title track from 1976's Black Market gave a snapshot of Pastorius transforming the low end instrument into, if not a lead instrument, one capable of mighty hooks. Joe Zawinul's Weather Report soared to new heights with Pastorius and Wayne Shorter in the lineup, but it's tough to argue whether or not their respective departures resulted in Weather Report losing steam. At any rate, Pastorius's next move was to wrap up work on an album called Word of Mouth. This is the starting point of Anthology: The Warner Bros. Years, a collection that only spans three albums. So if you already have copies of Word of Mouth, The Birthday Concert and Invitation, you already have a majority of what Anthology has to offer. What remains are only three tracks of the 22 track double-disc compilation, two of which were previously accounted for on albums where Pastorius was a guest musician. The one not accounted for is a live recording of "Donna Lee", which is interesting but not as refined as the version heard on Pastorius's self-titled 1976 record. Since The Birthday Concert and Invitation are both live albums, the studio tracks are naturally outnumbered on Anthology. One factor that strained the working relationship between Pastorius and Joe Zawinul was Zawinul's distaste for Pastorius's showmanship. Watching those old Weather Report shows, he sometimes looked like a rock star trapped inside a jazz band. But sure enough, the crowds as Pastorius's shows ate it up. You hear it at the end of every live track, the sound of an audience getting pumped up after hearing jazz! With horns too! "Liberty City", "Soul Intro/The Chicken" and "Invitation" are chock-full of zest, tight auxiliary percussion be damned. "Continuum" and the Weather Report leftover "Punk Jazz" slow the momentum to steady grooves. There is lots of overlap between these two live albums and, for many fans of jazz fusion, picking one version of "Continuum" over another is a matter of apples against oranges. Proportionately, Word of Mouth is represented just as favorably. Six of its seven songs are here on Anthology, leaving out the 12-minute take of "Liberty City". And what a brilliantly weird album Word of Mouth was. It begins with a bafflingly fast composition called "Crisis" where Pastorius plays seemingly every note on the neck as the horns scramble for a place to live. "Crisis" doesn't seem to have a center or a main idea driving it, but it somehow feels like an appropriate opener. His band channel the majesty of the far east for "Chromatic Fantasy" and ram the Beatles's "Blackbird" through a polyphonic skewer. Both tracks are short and end abruptly, as if someone accidentally sat on the mixing desk. And though Pastorius seemed to be taking a boppier direction in his solo career at this point, "Three Views of a Secret" and "John and Mary" demonstrate that he still had an element of Weather Report-esque fusion in his system. Anthology: The Warner Bros. Years wraps up with the three outsider tracks mentioned earlier: "Nativity", Mood Swings" and "Donna Lee". "Nativity" comes from percussionist Airto Moreira's 1977 Warner release I'm Fine, How Are You? and "Mood Swings" is drawn from guitarist Mike Stern's 1986 album Upside Down. Pastorius' presence is felt heavily on "Nativity", a track that swings from ambient world to something with considerably more drive to it. The duet with Mike Stern is some intense straight up jam fusion. The live recording of the Charlie Parker tune "Donna Lee", the one and only exclusive to Anthology, just doesn't feel worth it to me. Given how this release is just a few minutes shy of two hours long, Rhino and Warner Brothers probably should have just remastered all three of the Warner albums and presented them in one package. Compiling material from three discs for a two-disc collection seems a little strange. So while the quality of Jaco Pastorius's music was consistently above average during this time, there is no great need to consolidate it all in such a manner.